The Baynhams: Oi! Where's my royalties? Many of my friends joke that my camera is surgically attached to my hand as I love taking photos and bring my camera almost everywhere I go. 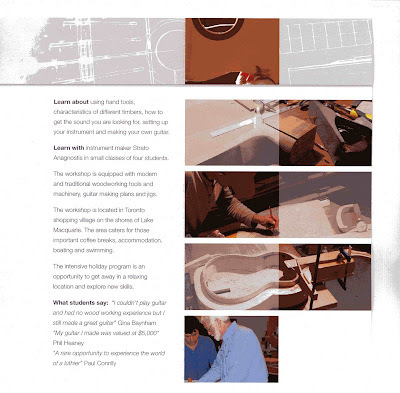 When I started doing my Guitar making I was unsure of whether the other people in the class would be put off by me taking a camera out while they were concentrating. When I explained about the blog and asked if anyone objected to me taking photos of my guitar during the class no one seemed to mind. Over the weeks Strato, the teacher, asked if I could take some more general photos of the class in progress for his own records and possibly some future promotion. Soon I was being asked by the other students to get the camera out to photograph their latest progress. I have now taken over 300 good pictures (and deleted hundreds more rubbish ones!) and will be burning a disk for each of us in the class when we are finished. 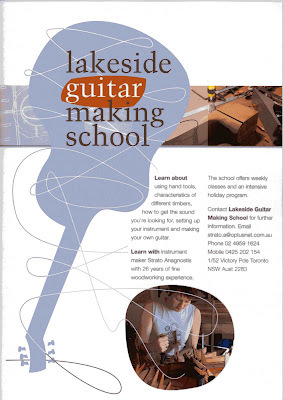 Recently I gave Strato a disk with the current photos on it and he sent it off to Tasmania to a Graphic Designer friend to produce some posters and brochures advertising the Guitar School. Here are the results! I am really chuffed to see the images that I have taken over the last few months being used in such a creative way.